Don’t ever, ever do the nightly reciting of the Psalms 91 or Psalm 37. Even though the psalms are in the bible, to use them in that way is witchcraft. It is not keeping you safe, it is putting you in more danger. If you need protection, it just doesn’t work like that. The outcome of a situation is up to God’s sovereign will. I don”t know what religious background you come from, but in the Charismatic churches I grew up in, we were always taught to do that, to recite scripture out loud, and that was “the sword of the spirit,” and that it would defeat the enemy. As a matter of fact, my mom had me reciting Psalms 91 every night specifically! Throughout my life, I would often speak it if I felt I was in danger or needed protection. I’m not saying it doesn’t work. It may very well work, but it’s not because God is the one doing the protecting. It is the fallen angels doing it.They are the ones to respond to those kinds of prayers, not the true God. So to make that work would be praying to and receiving from devils. The problem with the teaching of reciting scriptures out loud for that purpose is that it assumes that control is in our hands, and that reciting those scriptures is a way of enforcing that control. Control is in God’s hands and not ours. He did not intend for us to use His Word in that way. Doing so, of course a person has good intentions, they don’t know it’s witchcraft, but that doesn’t stop the evil entities from taking it as an invitation, as ground they can use to operate in your life. The only right way is to ask God for protection is according to His will. It’s up to what He wills to do, it’s not up to us to decide and make it happen by means of reciting scripture. But if a person isn’t born again, they shouldn’t pray at all, because those prayers will not be heard from the Father, but heard and answered by Sananda. To pray for protection would do more harm than good. 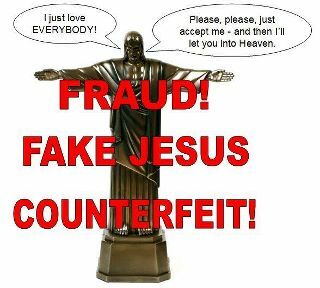 You’d be better off with no protection than with protection by the fake Jesus aka Jesus Sananda. He protects people like how a pimp “protects” his hoes. Yeah, he’ll protect them from the men, but only because those men threaten his property. In the meantime, he will abuse, beat, and exploit his women all he wants to. He only keeps them “safe” so he can use them to his own ends, as opposed to them being used to somebody else’s. He’s not really protecting his women. He’s protecting his commodity, which is ultimately just protecting himself. Protection from Sananda’s angels is the exact same thing. Yeah, they’ll protect you, because they want you as their property to exploit, they’re not about to let somebody else steal their exploit. Like, if a farmer has a pig he is fattening up to cook for Christmas. He’ll protect that pig from wild animals, but only because he wants to be the one to eat the pig. to learn more about how the enemy operates, click here. Untold professing Christians are seeking spiritual ecstasy or communion with God by adopting Eastern practices and they are coming away from it in torment. In fact, practically every call for deliverance I receive these days is from professing Christian chakra openers who are in torment with this energy. The most prominent sign is burning at the chakra points. Some people feel like they are on fire within. They also complain of body jerks, particularly around the crown of the head. Other manifestations include uncontrollable laughter, movements on the inside of the body. sexual contact, and astral projection where their spirits have their bodies. When demons enter the opened chakras, several report hearing condemning, accusing voices. Chanting– Vibration is very powerful. The power of sound can break glass, weaken steel, and cement structures. Vibrations cause the chakras to open and stimulate the kundalini at the base of the spine. The chanting reminds me of tongues. Clearly, the enemy’s purpose for tongues among those seeking The Lord is to release the Kundalini. The prayer language practice of the Charismatics and Pentecostals is very similar to chanting. Both the New Agers and Christian mystics become mindless as they utter. Controlled Breathing (pranyama) – Different methods of controlled breathing are specific to each chakra. “Christian yoga has become acceptable in the denominational churches. Furthermore, Christian therapists are implementing controlled breathing to ease anxiety. They ask their clients to count to a certain number as they inhaled, they hold their breath for a certain number, then exhale for a certain number, very similar to the eastern breathing practices to open chakras. Visualization and concentration– Occultists are taught that through visualizing and focusing your mind on each chakra, you can open, close and control them. Visualization and concentration is also used in witchcraft, a separate subject to be addressed in another post.. There are several Christian practices that do a similar thing like contemplative prayer as an example. The main purpose of opening the chakras is to release the kundalini energy that lies dormant at the base of the back. According to occultists, if any chakra is blocked, the burning sensation would manifest. Also, the sensation of the crawlies near the crown chakra strongly indicates that a chakra is blocked. For example, if it were the 6th chakra as most sources of information available concur, the sensation would be at the throat or BENEATH the 6th chakra. From direct experience, it appears that the seventh is the most difficult chakra to fully open. Consequently, the sensation of the crawlies, compared by some to ants crawling, indicates that the kundalini energy is going *around* the seventh chakra and not *through* it as it should when this chakra has been fully opened. Other symptoms include pain and discomfort, especially when one’s kundalini energy is fully activated. The occultists advise on how to fix this situation. Their remedy is to temporarily close the chakras, the same way you opened them but in reverse. In fact, these folk will periodically close their chakras to avoid what they call psychic vampirism. Occultists claim that when all the chakras are open, they can pick up and feel all the negative energy from people and demons around them. This what they have called “psychic vampirism.” So when they close their chakras, they do it in the same way they opened them, namely through visualization. As is often the case, the occultist present a partial truth. So they are correct on one score. Helplessness and victimization are forms of passivity that are ingrained in religious churchgoers. This statement also tells us why God allows believers to be tormented by demons. It is when you open your chakras and release the kundalini, you are trying to become a god, which is a breaking of the Ten Commandments and an offense to God. Yet once you humble yourself and desire truth, God will have mercy on you and the evil spirits will have to cut you loose.